About more than a week ago, hubby decided that we go and visit the new mall near our place, Robinson's Malolos. So, since it was very hot, I guess it was a nice idea to go window shopping there, haha! The mall was more or less 10 minutes away from the subdivision where we live, so it's pretty near. Actually, the nearest mall to us is Walter Mart, it's just a stone's throw away because it's located just outside the subdivision. However, honestly, it offers limited areas to look around and with only a few stores. Anyway, it's also a new mall here so I still hope that they add more stores in the future. Glad that when we finally got to see Robinson's Malolos though, we found out that it's way bigger and offers a wider range of options. The little guy was kind of "afraid" to enter upon seeing the big building. He's no longer used to seeing one, unlike when we were still living in our rented apartment in QC, where SM North EDSA was our "neighbor", too. We were always at the mall almost every week and the little one was so used to it. We actually go there back then not to shop, pasyal tambay lang, sobrang mainit sa apartment kasi. Haha! We saw this train way too late. We were on our way home already. Anyway, while on our way out, we saw this train. Trev became super excited upon seeing it. You see, he loves all sorts of vehicles, and train is one of them! Apparently, customers can ride the train for I think around Ph35, and the train would ago around the mall. Nice! Hubby said we'll make sure to go back there next time, so Trev can try. 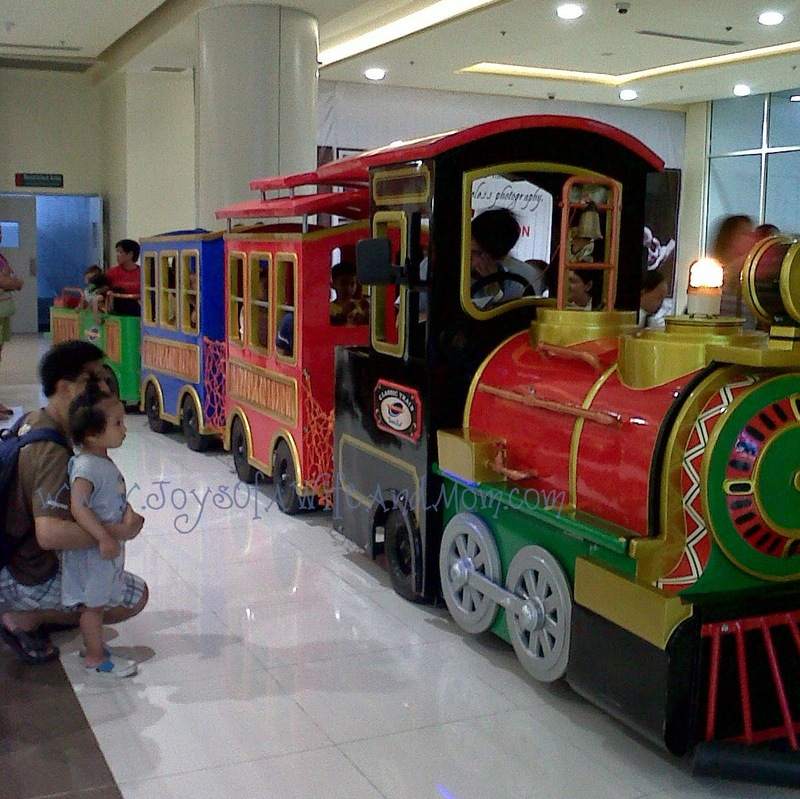 We have a train like that din in a mall here in Davao. We rode it about a couple of weeks ago and Yuri had fun. I'm sure Trev, a car-lover din, will have a lot of fun riding it, too! Have you tried SM Marilao sis? Malapit lang din sa palce nyo basta walang traffic. Kaya lang sabi ni Daddy A pinapataasan daw daan sa McArthur. Mukhang maganda yang Robinson's Malolos a, naalala ko ang pinupuntahan namin dyan is yung Uniwide hehe.